The King James Bible is a great translation of God’s Word… for 1611. While I appreciate the efforts of those who prepared this early English language Bible, sometimes I find it easier to read the original Greek than all those thee’s and thou’s. And that’s saying a lot because my Greek isn’t that great. What I need is a way to experience the rich language of the KJV in a way that brings it alive for me. What I need is the KJV with an electronic soundtrack. And that’s what I got with Book of Romans: The Unofficial Soundtrack. 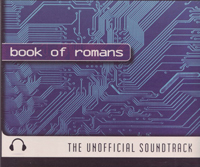 Book of Romans: The Unofficial Soundtrack is the work of Mike Avery and Matt Jacoby. What they’ve done is take the audio recording of Shakespearian actor Alexander Scourby reading the Book of Romans in the old school King James version of the Bible. Then they’ve produced and mixed in an electronic soundtrack. It’s the kind of thing you’d expect to hear on a Ministry of Sound CD or the Gorillaz latest album. And it sounds great. This CD is more than just listening to someone read the Book of Romans. This is an experience. You find yourself engrossed in what’s happening. It becomes an experience. While it will never replace opening up your Bible and reading it for yourself, Book of Romans: The Unofficial Soundtrack is a great way to mix it up and experience God’s Word in a different way. If you’re a fan of electronic music, you should really get your hands on this CD. I got my copy at the Bible Society NSW Bookshop. Is there somewhere to hear a sample of this? It sounds a bit bizarre to me, and I’d love to hear it. Not that I’m aware of. Bible Society is the only shop I’m aware of that is stocking the product at the moment. If you’re able to get into the shop, I’m sure they’d love to let you listen to a sample. If any one can find a link to a sample, please post a link here in the comments. There is a band called Soul Junk (radiation style avaunt-punk) who did a song for each chapter of Genesis and then each chapter of Exodus and they have them for free on their web page. I would love to hear your take on them. Search for the unofficial soundtrack on facebook and myspace. Thanks Terry. That’s definitely it! Keep on writing and cuihggng away!